In times past people tamed tricky grain with scraper planes. Unlike card srcapers, scraper planes have a thicker blade fixed in one position. They still utilize a burr which takes lacy thin cuts. You can find vintage scraper planes by Record, Stanley, Bailey and others. I made mine in the manner of the Great James Krenov. I like wooden planes as they glide so easily over your work. Once you figure out where to tap them to deepen or lighten your cut; they are quick and easy to set up perfectly. The Fall is my favourite time of year. I love the riot of color falling from trees as they change and drop to the ground preparing for a winter slumber. This is the time that every couple of years, or so, I resurface my bench tops. A scraper plane makes quick work of this task. Just like the leaves falling to the ground my floor will be covered with lacy shavings including the scrapes and dings from the past few years. I built my benches based on those advocated by the legendary Pauls Sellers. My main bench is beefier than his plans. 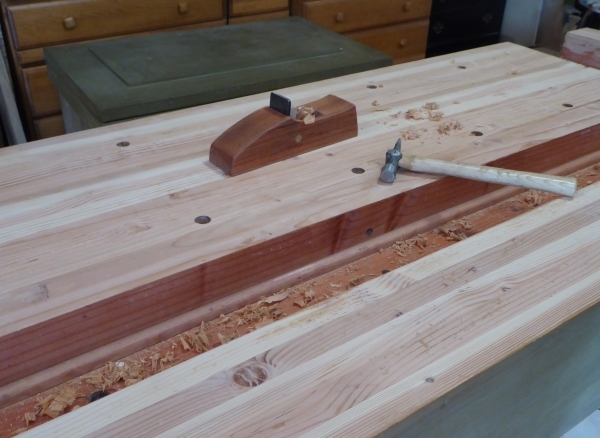 I wanted the extra weight for planing (didn’t need it) and the extra width to accommodate larger instruments. The second bench I built is pretty much to his exact specs (except I made the tool well wide enough to accomodate a violin or tenor ukulele). Since the tops of the benches are laminated together from multiple boards, the grain doesn’t always run in the same direction. It is for this reason that I love the scraper plane to make them dead flat with virtually no tear out. For those of you who are not familiar with Paul, I highly recommend that you follow my link to his website. He is such a great advocate for learning how to work wood by hand (as opposed to machining it with power tools). He was apprenticed to craftsmen; some who were born in the 1800s. I encourage you to take advantage of his experience and knowledge. Scraping planes are great for surfacing lute ribs, guitar ribs, instrument backs, and you name it. Best of all, you don’t need to wear the respirator and hearing protection you would need if you used a belt sander.